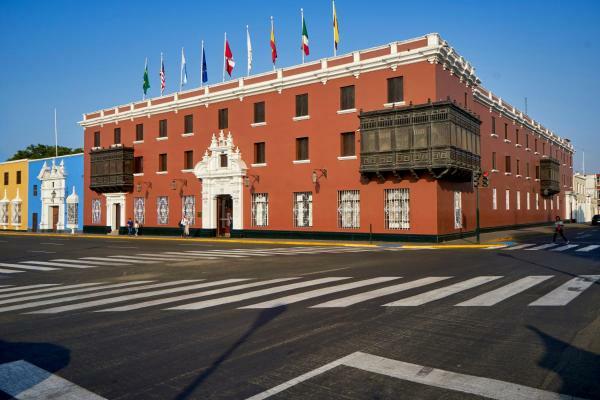 Located on a privileged corner of Plaza de Armas main square and offering views of historic buildings from the colonial era, Hotel Libertador Trujillo provides accommodation in Trujillo. Guests may visit the pre-Inca Chan Chan ruins and the Sun and Moon temples, only a 10-minute drive from the property. The property has a restaurant, Las Bóvedas, serving authentic cuisine from the Libertad region. A 24-hour room service is also available for guests. Guests may lay back and enjoy a casual drink at Malabrigo Bar. Also, the property has 2 conference rooms with a capacity of up to 172 guests. Furthermore, the property has a 24-hour front desk service and Wi-Fi in public areas at an additional cost. Nightly rates from $79 to $250. Room facilities: Minibar, Shower, Bath, Telephone, Air conditioning, Toilet, Bathroom, Cable Channels Can you tell us what you'd like to see here? This suite has a seating area, air conditioning and cable TV. The room comes with 220 and 110 volts. Room facilities: Minibar, Shower, Bath, TV, Telephone, Air conditioning, Seating Area, Free toiletries, Toilet, Bathroom, Cable Channels Can you tell us what you'd like to see here? Located in the centre of the city of Trujillo. Construction of the colonial era. With venues for the development of forums and cultural development. The lady at reception is not friendly, I did in booking my reservation and not even when he saw her. Came driving from Lima to Trujillo, I got type 8:30pm. I asked specially for a quiet room when I made my checkin, and they gave me a room with a lot of noise, not inside my room, it was the air conditioning of the hotel. I changed room, I had to ask for slippers and robes and go out in pajamas. The rooms definitely lack details of decoration, the bedspreads are white and the furniture is brown, point, not more! The opening hours of the sauna is from 9am and the breakfast until 10:30am, the literal you're going to the breakfast run to the 10 and you're still sweating. The brochure in the room says breakfast with breads, specially prepared in the hotel, varieties of breads and gluten free breads, I avoid eating gluten (I'm celiac), you first do not make their bread and there are no gluten-free breads. It says detox, on this you have only juice of fruits and green vegetables. For detox you can go. The parking lot is 3 blocks from the hotel, in my checkin, I had valet parking for my checkout told me the buttons that best go walking because it will take in bringing the car for the traffic in the area, the bellboy helped me with the suitcase to the parking lot. My daughter and I both thought that we would not go back to that chain of hotels. A pity the hotel Libertador Trujillo! An enviable location, in the same square of arms of the city. The food is very good and the exact amount in your restaurant. (not to terminate Empachado) The rooms are well equipped although I was assigned the bed was broken (I sat down and went to the ground), a corroborated boy who was already well and had not noticed. We were moved from room and not only apologized, we were offered 2 welcome drinks as well. Good service from the restaurant and Bar. Very good service, friendly peesonal, good facilities, big bed and comfortable, good experience. And the restaurant pretty good! Nice costly hotel. The upgraded room we were given was actually a 12x14 room with a king bed, very small window looking into an alcove that overlooks the interior pool area. (No other windows. ). There is a washbasin in the room so no privacy there. The sink sprites little water so washing is difficult. A toilet / shower room completes the area. The bottled water looks free but the fine print shows it is 8 soles each. There is a safe. The room is actually a lock-off room within a lock-off. Strange. Only here one night so we did not raise a fuss. Would not stay there again. Was fancy but now just old. Older hotel in town square but the rooms were very nice and clean. The hotel staff very friendly and helpful. A nice bar area of the lobby. I would stay here again. The bar and the terrace are relaxed atmospheres and advisable to go to converse. The attention is very good. We really enjoyed our stay in Trujillo, excellent service, exceeded our expectations. I love this hotel! In the past two and a half years I have stayed there at least 6 times, the longest was for 6 days. The rooms are small but luxurious. The breakfasts among the best anywhere. It's location in the old center of the city is great with wonderful restaurants nearby. The staff is efficient, friendly and seeks to make ones stay pleasant. There is a pool which is warm in the summer, but a great place to sit, talk or have breakfast year-round. The Libertador provides a wonderful oasis to stay and just to have a fresh-squeezed limonade if you are walking by and need a quiet place to re-energize. Just spent 2 weeks at this hotel, staff very friendly and helpful. The Hotel is wonderful and everything is great. Love it! Great place, very fast internet (15 up, 15 down) and courteous staff. Prices are a bit extreme for the area, but you wouldn't come to this hotel if you weren't expecting that. Awesome location and wonderful staff; super helpful and accommodating. Clean rooms and centrally placed directly across from the plaza. The front suites are louder since they are above the Main Street but they have quieter rooms in the back next to the pool. Excelente atención del personal. Destacado. Please note that if paying in cash, guests are welcome to pay in Peruvian Soles or US Dollars. One older child or adult is charged $ 70 per person per night in an extra bed.